With wine, my favorite and most memorable moments happen when I’m surprised. This happened just a couple weeks back when I had the chance to taste through the portfolio of Beni di Batasiolo with the winery’s president and managing director, Fiorenzo Dogliani. Admittedly, my experience with the wines of Piedmont is limited. While I arrived to the tasting most interested in trying Piedmont’s flagships, Barolo and Barbaresco, it was two whites that caught me off guard and reminded me why this hobby is so enjoyable. The first wine to catch my attention was the leadoff hitter in the lineup — a 2010 Gavi di Gavi. This was my first taste of the Cortese grape, but I’ll seek out more. From vines found in red soil and sand and named for the village in which it’s grown, it had a wonderful nose of spring flowers and an interesting palate of lemon, green apple, and some spice. I initially likened it to a Sauvignon Blanc, but it had a bit more heft and refreshing acidity, so it would stand up to all sorts of foods. The other wine that grabbed me was a 2010 Moscato d’Asti. In the United States, the reputation of these wines is tarnished by the many mass-produced, overly sweet offerings commonly found on supermarket shelves. But listening to Fiorenzo speak passionately about his Moscato while we enjoyed it sparked my interest in such wines. 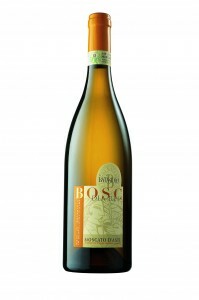 Beni di Batasiolo’s Moscato d’Asti had a massive nose of pear, melon and pineapple that initially worried me — I feared the wine would send my blood sugar soaring. What I found, however, was an airy, uplifting wine with a subtle spritz and touch of sweetness that was much lighter than anticipated. At only 5.5% ABV, this would make a perfect picnic companion or lakeside sipper. In listening to Fiorenzo and his friends talk about Moscato, I learned that the secret to his wine lies in the soil and his attention to detail. The calcareous soil often found in Piedmont is effective at producing full-bodied grapes that don’t require a heavy dose of sugar to hide their imperfections. While Moscato does not receive much respect in the United States, it was clear while talking to Fiorenzo that Moscato d’Asti is serious business in Peidmont. So, as summer approaches, forgo the cheap supermarket Moscato and take the extra time to seek out a true Moscato d’Asti from Piedmont. You might be surprised at how enjoyable it can be! Weekly Wine Roundup: Summer in March! This week, David and Robby check in on Bordeaux and California while I pull a sauvignon blanc from the cellar in anticipation of this week’s spring shipment from one of my favorite domestic producers! On Monday, I visited Central, a Michel Richard restaurant in DC, with fellow Terroirist Robby Schrum and an out-of-town friend. Robby brought a 2006 Jean Edwards Napa Valley; I brought a 2010 Kutch Pinot Noir Sonoma Coast; and we ordered a 2009 Hamilton Russell Chardonnay off the menu. The Jean Edwards Cab was fantastic. I wasn’t familiar with the producer, and I’ll definitely be seeking it out in the future. Opening the Kutch was infanticide, but the wine drank beautifully — a true Sonoma Coast nose (complete with black tea, tart cherries, and blackberries); a concentrated but not thick palate; and great structure and acidity. The Chardonnay was stunning. While I’d heard good things about Hamilton Russell wines, I’d never actually tasted one — and it delivered. Even though it was big, it showed freshness, great citrus notes, minerality, and nice acidity. This could easily pass for a very expensive white Burgundy. On Tuesday, I attended a WineAmerica event at the U.S. Capitol. Even though I didn’t take any formal notes, it was fun to taste so many wines from so many different states. Todd Godbout has a nice summary of the event on his blog. On Sunday, I opened up four fun wines with some friends as we enjoyed the spring weather. First up was the Domaine la Croix des Marchands’ Fraîcheur Perlée, purchased from First Vine for just $12. A blend of equal parts Muscadlle, Mauzac, and Loin de L’oeil, this wine is a perfect summer quaffer — floral, fruity, simple, and crisp. We then opened the 2011 Arnot-Roberts Touriga Nacional Luchsinger Vineyard and the 2010 Matthiasson White Wine — these are probably my two favorite wines right now. 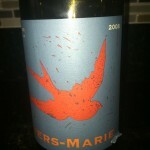 Weekly Wine Roundup: A 2010 Bedrock! Check out what the Terroirists drank this week, including notes from Matt’s most recent visit to Lotus of Siam, Robby’s impressions of (yet another) Robert Keenan selection, and Jeff’s notes on a recent Bedrock Wine Co. release! Plus, Sarah partied like it’s 1999! I spent some time out in Las Vegas last week and had a great dinner with some wine friends at Lotus of Siam. One of my favorite restaurants in Las Vegas, it’s also one of the epic “must-visit” restaurants in the country if you’re serious about wine. We didn’t have a theme for the dinner, but it ended up being Loire focused. The usually epic 04 Bregeon Gorges was a bit tamer than my other experiences with it – the fruit seemed a touch duller with less minerality than before. Our second wine was the table’s wine of the night – a 2010 Puzelat Pinot Noir. Most people don’t think of the Loire when thinking about Pinot Noir, but the combination of crunchy red fruit, underbrush and crushed rock was just wonderful – this must be one of the best sub $20 pinot noirs out there. Shifting gears we moved into some older wines starting with a 1996 Druet Grand Mont. I had some great experiences with the 1995 and 1997 of this cuvee, so was eager to see to this could compete with those vintages. Sadly, this seemed tired. The flavors were plummy and flabby and lacked the regal aged Cabernet Franc tones that I found on the 1995 and 1997. My buddy Joe Hauck brought a great 1987 Ridge Geyersville that was hard to peg as a zinfandel. Nonetheless, it had great complexity and tertiary tones of floral notes and smoked meat…wonder if any syrah was blended into this??? Weekly Wine Roundup: A Terroirist’s Favorite Wine in the World! This week marks Winn Roberton’s inaugural appearance in the Weekly Wine Roundup, and he doesn’t hold back. Read on to find out which wine might just be Winn’s favorite wine in the world! Although I tried quite a few wines this week, only two to report on for the round-up – both pretty interesting. First I opened a fun bottle of Israeli rose that was recommended to me by the staff at Columbus Wine & Spirits. It was the 2010 Recanti Rose from Galilee. Without the recommendation, I would have likely overlooked this wine due to its color. It is REALLY aggressive, like Legally-Blonde-style, pink. However, the wine is dry and, while bursting with fruit, not cloying or fruit punchy. It’s lively, refreshing, packed with strawberry, and balanced by a nice acidity, perhaps due to the chillier growing conditions in upper Galilee, well above sea-level. Great wine for a picnic or summer brunch. My other wine for the week was one I ordered at dell’anima last weekend at the recommendation of sommelier Joe Campanale. I *think* it was the 2002 Calabretta Etna Rosso (not 100% positive of the vintage). I was dining with a couple of my best friends and this wine was the perfect accompaniment. Worthy of conversation, but not overly demanding or distracting. Dried cranberry, some smokiness, something very southern Italian, and a really cool hit of graphite and minerality. Perfectly enjoyable and also a bit mysterious/heady. For my first contribution to the Weekly Wine Roundup, I may need a disclaimer. The 2003 vintage of this wine was one of those wines that made me say, “Damn, wine is awesome,” thus continuing my delve into the world of fermented juice. The wine in question is the 2005 Paolo Bea Sagrantino di Montefalco, Pagliaro Vineyard. The unassuming Bea family is documented to have been in Italy’s Umbria region since 1500. They keep things very traditional, dedicating their 5 of their 15 hectares to grapes, leaving the rest to olives, fruits, vegetables, and grains, on all of which the family subsists. Paolo Bea, the patriarch of the current Beas, still works in the vines daily. He is in his early 70s. I always make sure a prospective buyer of this wine is familiar with, and isn’t afraid of a bunch of earth and tannins. After finishing off a Barolo and a Brunello, I suggested the host “lower the boom,” with the Paolo Bea. My first taste, just to determine the wine’s health, was overrun with metallic taste and a hard clayey minerality. This is to be expected from such an elephantine wine, but no flaws, so into the decanter it went. The wine went over well at the table, and the host was generous enough to leave about 8oz in the decanter as they left. Ah, the troubles of being a sommelier. I finally got to the decanter at the end of service, about 3 hours later, about how much time the wine needs. The nose was full of violets, plums, black cherry cola, leather and roasted meats. The palate introduced itself with a haunting taste and weight of sweet prunes, and fennel. The first inkling of tannins were supple and velvety but left with a noticable grip on the gum lines and cheeks. The finish was an integration of savory herbs, smoked meats and a beautiful soft clay minerality. I can still taste it. This is serious wine. Seek it out, have some time to decant it, and have a big piece of red meat nearby. My future wine roundups won’t be waxed so poetically, but seriously, this might just be my favorite wine in the world. While skiing in Illinois (yes, Illinois) for my birthday, I popped a bottle of 1995 Graham Porto Malvedos to warm the soul. Unfortunately, this juice was too warm. Hot, in fact. I opened the bottle eight days ago and it’s still sitting in my fridge, too hot to handle. I did catch a bit of raisin and toffee beneath the heat but I’m hoping it has more to offer down the road. This past weekend I opened two bottles that were wonderful for different reasons. First up was a 2008 Brewer-Clifton Chardonnay Gnesa. I was anxious to taste this as I’ve been trending more toward old world chardonnay in recent months and I know the SRH appellation has a reputation for towing the line between the new and old worlds. This bottle didn’t disappoint. The nose, initially, was a bit off putting with some sulphur but that blew off pretty fast. The fruits are certainly present, and at times almost heavy, but there is also lots of lemon, juicy acidity, and a touch of saline. For more on the SRH appellation, see this piece from Jay McInerney in the Wall Street Journal. 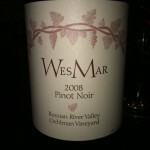 I also popped a 2008 Rivers-Marie Pinot Noir Sonoma Coast to celebrate the shipment of Rivers-Marie’s 2010 pinots. This wine has a lofty reputation in its price range and it’s well-deserved. You’ll be hard pressed to find a better value at $25. Popped and let breath for 30 minutes, found a great nose of baking spice, oranges, and raspberries. The fruit is the star but it’s not jammy. Wonderful apple up front with raspberries and cranberries. Great acidity, perfect food wine, and awesome value! Weekly Wine Roundup: Opus One! Check out the latest tasting notes from the Terroirist team, including Rebecca’s pretty epic tasting of Opus One’s recent releases. I had a great week of wine. I started out on Monday with an Opus One tasting of four vintages – 2005, 2006, 2007, & 2008. I’ll be doing a more in-depth tasting next month with winemaker, Michael Silacci, but in the meantime here are brief tasting notes. Everything was, to put it technically, yummy. The 2005 Opus One had a woodsy, cigar box nose that was dominated by secondary/tertiary scents and only with more restrained deep blackberry and blueberry notes. The palate had the same fruit profile balanced by tobacco, a little leather, and integrated tannins. The 2006 Opus One was brighter and fresher – deep raspberry, brambly black fruit. On the palate you got the new French oak, which the wine had been aged in for ~18 months – toasty vanilla, a little spice, and then more black currant. The 2007 Opus One had muddled blackberries, blueberries, and dark raspberry on the nose. It smelled like a young, well-made Napa cab that my mother would die for. The profile then evolved into more oak character than I’d expected from the nose (allspice/cinnamon). Still very fruit-forward, almost like a blueberry pie; delicious, but will improve gracefully with age. 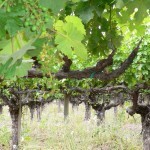 On the 2008 Opus One, I got greener, vegetal notes (funky growing season? Or the Petit Verdot/Cab Franc? ), cassis, a little anise. The mouth was surprisingly tannic and drying with leather, sandalwood, deep black currant, and considerable heat (alcohol content?). I enjoyed a big messy burger for a romantic Valentine’s Day dinner Tuesday, then followed it up with a glass of 2009 Suhru Shiraz, which I’d picked up on a trip to the North Fork of Long Island. I was intrigued by this wine because it smells and tastes like peppered, teriyaki beef jerky. No joke. Beef. Jerky. Kind of weird and kind of awesome. Saturday I went to the Tre Bicchieri Italian wine event here in New York. Be on the lookout for a separate post on this event! I was on the road this week and was happy to reconnect with some wine friends in both New York City and Chicago. In New York, I met up with some friends and a wide selection of wines were opened. The NV extra brut cuvee from Marie-Noelle Ledru was closest to taking home the honors of wine of the night amongst the group. This was recommended to me from wine wunderkind Salil Benegal who spoke very highly of her wine making style. It wasn’t a powerful Champagne – in the mold of, say, Krug – but much more feminine and exotic. Beautiful floral notes merged with sweet lemon and lime tones to create an elegant and racy champagne. For me, the other highlight of the night was the 2004 Bernard Levet Côte-Rôtie La Chavaroche. This was a rustic syrah with dense olive and meat tones that, to me, are the essence of the grape. While incredibly young, this already speaks of its terroir and should only increase in complexity with time. Read my complete notes on the evening here. Kevin Sidders, founder and president of VinConnect, likes to say that he is his target customer. A wine enthusiast who was inspired by tech entrepreneurs he met while working in Silicon Valley, Mr. Sidders was anxious to merge these two interests but unsure of how to proceed. So he enrolled in UC-Davis’s OIV Wine Marketing program, where he learned all about the business of wine, covering just about everything outside of growing grapes and making what’s in the bottle. The two of us recently chatted by phone. And even though Kevin recounted many obstacles in the way of making this idea a reality, VinConnect at its core is not unlike many domestic mailing lists. After providing an email address to VinConnect, you simply opt to receive offers from whichever VinConnect partner wineries you’re interested in. Once you’ve made your choices (you can opt in to as many or as few wineries as you’d like), you just sit back and wait for the offers to arrive. VinConnect focuses on limited-production high-quality wines, both from established estates such as Clos de Tart and Massolino as well as emerging producers like La Macchiole in Tuscany and Gourt de Mautens in the Rhone Valley. For more information on VinConnect, read how it works and check out their partner wineries. This week, several Terroirists reached for old world offerings and uncovered some gems, while David reached for some older American wines. Check out our impressions below! 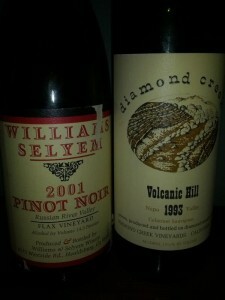 On Saturday night, I opened up two California gems with a handful of friends in New York City — a 2001 Williams Selyem Flax Vineyard Pinot Noir and a 1993 Diamond Creek Volcanic Hill Cabernet Sauvignon. The Williams Selyem was beautiful, but a good deal riper than I would have expected — it certainly couldn’t have passed for a Burgundy. Sweet baked cherries & cherry jam, boysenberries, cola, some floral notes, and vanilla. The wine needed more acidity — the finish just wasn’t bright enough — but overall, it was a great example of an aged California Pinot. The Diamond Creek was stunning. Plenty of fruit still present, with sweet herbs, cedar, and spices underneath. Soft tannins, refreshing acidity, great structure and balance. This wine is in a great spot right now, so if you have any, drink up! You should know something about me. I hate boring, nondescript wine. Thankfully, this doesn’t make me unique and I get the sense that more and more wine consumers are as sick and tired as I am with cookie-cutter, passionless, mundane plonk. It is with this in mind (in addition to the prodding of wine whiz Jess Chatfield at Crush) that I decided to investigate a region I know nothing about – the Savoie. It’s tucked into the rugged alpine terrain of Eastern France, not far from the Swiss border. It’s probably most commonly known for their white wines as only a small number of red varietals are able to ripen in such an environment – despite this, I chose to taste two reds both produced from the Mondeuse grape. My first bottle was Charles Trosset’s Cuvee Confidental from 2007. This flat out shocked me. It was my first time having Mondeuse and I liken it to the aromatics of a syrah with the weight of a pinot noir. The nose was utterly exotic – my girlfriend described it as “grilled sausage and green peppers”. The meatiness of this wine would have made the most rustic Cornas, Cote Rotie’s, or St. Joseph’s blush. Its palate was airy, but the flavor was cranked up – a potent combination for me. Its meat and floral tones were textured, rustic and deep. I paid $18.99 for this and felt like it easily competes with $50-$75 Northern Rhone wines. A steal. Later in the week I tried another Mondeuse this time from Jean Vullien. If the volume on the Trosset was turned up to an 11, this was more of an 7. The flavors were slightly less expressive and while I still thought it to be an outstanding wine, didn’t have the “wow” factor that the Trosset had. Nonetheless, it was a great week of wine discovery for me and I urge all of you to try something similar. I attended the first class for Columbia Business School’s Wine Society. My two favorites were the 2006 Michel Magnien Clos St. Denis, which was absolutely beautiful. A rich floral nose with a background of forest. Perfumed red cherry, but not overly sweet. Aged in 100% new French oak. My #2 wine was the 2006 Jean-Michel Guillon Mazis-Chambertin. The nose on this had “red Burgundy” aromas mixed with some tire. Woodsy, yet pretty. A little more drying than my #1. I think this one could age a little longer and evolve into something spectacular. Both were delicious. I also opened a 2009 Vietti Barbera d’Asti Tre Vigne, which was perfect for a night in with Italian delivery. Bright, tart red cherries, dust, and great acidity to balance the rigatoni with veal meat sauce I’d ordered. Weekly Wine Roundup: QPR Riesling! Check out what the Terroirists drank this week, including three interesting, wallet-friendly reislings! This week, the only wines worth noting were consumed on Friday night at Charlie Palmer Steak in Washington DC, where I dined with fellow Terroirist Robby Schrum and a good friend of ours. We started with a 2005 Littorai Chardonnay Charles Heintz Vineyard, and it was beautiful. On the nose, the wine exploded with ripe pineapples, baked apples, topical fruit, hazelnuts, and vanilla — making the wine much richer than I expected. The ripe fruits were perfectly balanced with lively acidity and a precise mouthfeel, making this one of the best New World Chardonnays I’ve ever had. 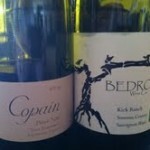 We then moved onto a 2007 Copain Syrah Spirit Rock Alder Springs Vineyard from Robby Schrum’s cellar. The wine is fantastic and well-crafted, but will definitely benefit from a few more years in the cellar. Right now, blue fruits dominate — with stems, sweet herbs, white & black pepper, crushed rock, meat, and spice underneath. We ended with a 2005 Match Vineyards Cabernet Sauvignon Baconbrook. It’s a very elegant Napa Cab, in that the fruits are ripe without a hint of pruniness. Pure black fruit, some floral notes, and chocolate, balanced with good acidity. This week I wanted to try out some 2010 German rieslings so I opened up a couple from Selbach Oster. They are, in my opinion, the best QPR producer in the world. Their wines are simply world class with price points starting around $15. They’re one producer I don’t debate buying every year. I opened their Zeltinger Sonnenuhr Riesling Kabinett and their Graacher Domprobst Riesling Spätlese the other night. For me, the Kabinett was just spectacular with expressive white floral notes, tropical fruit tones and fresh mineral undertones. For $22, it’s one of the best rieslings I’ve had. The Spatlese seemed overly dense for me, and while the fruit was vivid and cool, the acidity was a hair too meek. Those of you that drink a lot of German riesling may have noticed how some of today’s Kabinett taste like the Spatlese of years before and today’s Spatlese taste like Auslese of before – this is what was happening here. This week’s wine roundup features a bevy of winter reds. 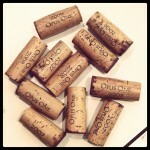 It looks like the Terroirists drank very well this past weekend! Last week was amazing — thanks entirely to the wines I opened on Friday night in Austin, Texas. The evening started at the headquarters of Wines.com, where I filmed a feature on “esoteric whites from California” with Bill Elsey. I selected the wines from my own cellar, and decided to bring out three bottles — the 2010 Massican Annia; the 2010 Matthiasson White Wine; and the 2007 Chimney Rock Elevage Blanc. 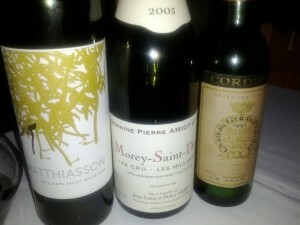 Regular readers will recognize these wines, as they were among my “11 Most Memorable Wines” of 2011. The video should be up on Wines.com (and cross-posted here) in about 2-3 weeks. After leaving Wines.com, I headed to Wink, one of Austin’s first farm-to-table restaurants. The food was delicious. From the hamachi sashimi and the seared foie gras to the duck and the antelope, the kitchen was obviously firing on all cylinders. The Les Millandes was stunning. I followed the wine’s progress over three hours. It opened with wonderfully pure, ripe red fruits, great minerality, a hint of earth, and firm, linear tannins. As the wine opened, sweet anise, cardamom, cinnamon and allspice emerged, with incredibly juicy cherries and raspberries remaining present. The red fruits turned tart as the night went on, but the wine never lost its depth or concentration. Without question, the Les Millandes was of the most vibrant Burgs I have ever consumed. The ’82 Gruaud Larose was most notable for its youth. Even though the wine came from a half bottle, the wine showed no bricking at its edges — and everything about it was fresh. Unfortunately, that freshness included gobs of brett, which I found difficult to ignore. Underneath the brett, though, was a beautiful wine. On the nose, aromas of coffee, pencil lead, cedar, blackberries, redcurrant. On the palate, the wine had great balance and depth, with a wonderful lift at the finish. To celebrate #PortDay, I tasted a bottle of 10, 20, and 30 year old Tawny’s from Sandeman. Being a creature of habit, I’ve avoided Port after a couple boring bottles a couple years ago – so this was a chance to give them a try again. All three bottles were impressive and surprised me with their elegance and nuance. I started with the 10 year old Tawny and unsurprisingly it came with the densest flavors of molasses, orange, florals, and smokey nuts. The 20 year old Tawny was lighter in color, and had more expressive floral notes than the 10 year old. The molasses tone was more subtle and it had a nice dark fruit profile to it. Lastly, the 30 year old Tawny was still lighter than the 20 year old bottle and featured a more delicate, elegant profile. The intensity of the dark fruit and molasses were toned down, but the flavors were integrated incredibly well. Weekly Wine Roundup: Montelena, Rivers-Marie, and Others! The terroirist crew really got around this week. Check out our impressions on a slew of wines from around the globe! On Monday, I got together with a small group of friends to open some rock star California Cabs from the 1990s, along with a 2008 Rivers-Marie Summa Old Vines. In case you missed my tasting notes, you can check them out here. On Wednesday, I attended an 11-vintage vertical dinner of Chateau Figeac. The dinner was hosted and organized by Panos Kakaviatos, and Figeac owner and winemaker Eric d’Aramon flew in for the event. Attendees included fellow Terroirist Rebecca Canan, some DC wine geeks, John Gilman, Dave McIntyre, master sommelier Kathy Morgan, and many others. My full notes will be published later this week, but well-known taster Kevin Shin has put up his notes on CellarTracker, and Panos has written about the event (and put up a video) on his site. Over the weekend, I opened a 2008 Two Hands Cabernet Sauvignon Some Days Are Diamonds; a 2008 La Follette Chardonnay Lorenzo Vineyard; and a 2009 Talty Winery Zinfandel Filice Connolly. The Two Hands wine needs a boatload more time. It was a pop-and-pour, and only started to come together as anything beyond a gigantic Napa Cab after about an hour. The La Follette Chardonnay, sadly, was a dud — too much movie-theater popcorn. The Talty Zin, as always, was delicious. More raisiny than I would have expected, but bright and lively nonetheless. My highlight of the week was a 1990 Chateau Montelena Cabernet Sauvignon Estate that was a going away gift from Ian Lipner when I left DC. This was elegant from beginning to end with a dusty red fruit profile that is so characteristic of older Napa Cabernets. The Estate bottling from Montelena continues to be a favorite of mine (their Napa designated Cabernet is FAR more hit-or-miss) from the region. Later in the week I had a spectacular young Cabernet Franc from Bernard Baudry. His exciting 2006 La Croix Boissée is fresh, vibrant and built for superstardom. Talk about a young wine, though. It took a couple of hours for this to become expressive but showed beautiful “forestal spice” throughout with beautifully silky red fruit underneath. This wine from Baudry can be found under $40 and is one of the better value red wines in France. The wines of Jacques Puffeney continue to interest me and I opened his racy 2009 Jacques Puffeney Arbois Cuvée Sacha and the elegant 2008 Jacques Puffeney Poulsard Arbois “M”. The Cuvee Sacha is a Chardonnay blend as has vibrant roasted nut notes with incredible minerality and structure. The Poulsard is one of my favorite cuvees from the Jura – so lithe, so elegant and so complex. Beautiful cranberry notes mix with dried rose petals and fresh herbs. These are intellectual wines that will challenge you.